In today’s world we have come to depend upon all of our electronic toys. Without them society would be in chaos, the power grid will collapse, most vehicles will stop, and computers will not function. Most people today have no idea of what the effects of a high-altitude electromagnetic pulse (HEMP) device would be. An electromagnetic pulse (sometimes abbreviated EMP) is a burst of electromagnetic radiation that results from an explosion (usually from the detonation of a nuclear weapon) and/or a solar flare. The resulting rapidly changing electric fields or magnetic fields may couple with electrical/electronic systems to produce damaging current and voltage surges. In military terminology, a nuclear bomb detonated hundreds of kilometers above the Earth’s surface is known as a high-altitude electromagnetic pulse (HEMP) device. Effects of a HEMP device depend on a very large number of factors, including the altitude of the detonation, energy yield, gamma ray output, interactions with the Earth’s magnetic field, and electromagnetic shielding of targets. 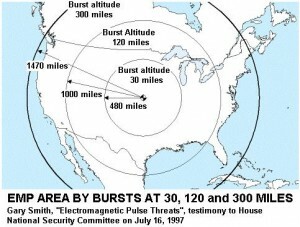 The following map show the effect of a 1-2 megaton weapon detonated at different altitudes about the United States . There are some things that you can do to protect yourself and your electronics from EMP. One is the use of a Faraday cage. In the next few days we will post a simple design to help you protect small items. In a Nuclear Emergency when do you start taking Potassium Iodide. This entry was posted in EMP, nuclear and tagged electromagnetic pulse, Faraday cage, HEMP, nuclear EMP, Radiation. Bookmark the permalink. I would like know do the united states have the same wepon. If not why we don’t . You can rest assured that the United States has the latest in nuclear devices designed for the most effective use of weapons possible. At Lawrence Livermore labs in California. Research goes on around the clock in development of the most innovative and devastating hardware. I would not be surprised if the United States has a counter EMP device to neutralize the effects of a hostile EMP device launched against the U.S. I would assume you are completely correct. That would be a deterrent to nation-states but very possibly not to rogue elements, such as terror groups. We do have the capability to cause EMP. The problem is we depend too much on electricity. It doesn’t take electricity to ran a camel.